Imagine your life without power. The conveniences you enjoy and the essentials you rely on are suddenly gone. No lights, no heat, no air conditioning. No sump pump to keep your basement dry. The food in your refrigerator spoils. But it doesn’t have to be that way. With a GUARDIAN® Standby Generator, your power will return within seconds of an outage, keeping your home and your family safe and secure. Because it’s fully automatic, your GUARDIAN Standby Generator will produce electricity as soon as it senses a power outage - 24 hours a day, 365 days a year, even if you’re away. Unlike a portable generator, there are no switches to flip, extension cords to plug in or gas tanks to fill. 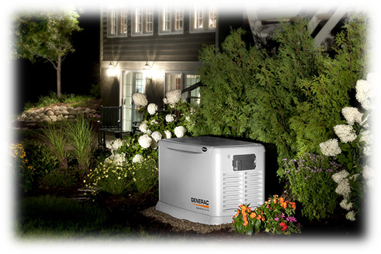 GUARDIAN Automatic Standby Generators are connected to your regular natural gas or propane service, providing you with continued power during an outage of any duration. GUARDIAN® Standby Generators are completely automatic, helping to ensure that you remain safe from the negative and potentially harmful effects of power loss. The GUARDIAN system automatically and continuously monitors incoming power from the utility line. The automatic transfer switch safely closes off the utility line and simultaneously opens a new power line from the generator. ﻿Your GUARDIAN generator supplies electricity to the critical circuits you previously chose to back up. ﻿When utility line voltage returns, the system transfers the electrical load back to the utility line. The generator continues to run for an engine cool-down period of several minutes and the entire system stands ready for the next power outage. An automatic standby generator is a back-up electrical system that operates whether you are at home or away. It automatically supplies power to essential circuits of your home within seconds of a utility outage. After utility power returns, the generator shuts itself off and awaits the next outage. It operates on natural gas or liquid propane and sits outside just like a central air conditioning unit. GUARDIAN® generators supply electricity to the electrical panel circuits of your home through a built-in load center. You select the number of circuits you want to protect and match it to the appropriate generator system. Everything on that circuit will be protected. GUARDIAN also powers furnaces, air conditioners, well pumps, water heaters and other appliances that are hard wired into your electrical panel. 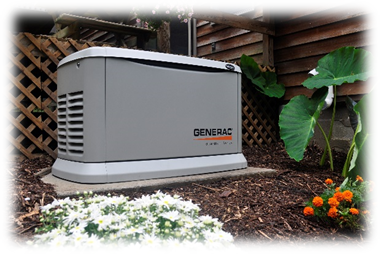 Why should I buy an automatic standby generator instead of a portable generator? While portable generators do supply power, an automatic standby generator produces a higher quality of electricity. It operates automatically and runs a weekly self-test to ensure proper response to your needs. There are no extension cords to plug in and no gas tanks to fill. It operates automatically so it protects your home even when you’re away. When utility power returns, the standby generator shuts itself off. Do they have to be maintained? Just like your car’s engine, generators need periodic oil and filter changes. Many customers rely on GUARDIAN’s preventative maintenance kits to satisfy routine maintenance requirements. Refer to your owner's manual for routine maintenance procedures and schedules. Kits can be purchased through the business that sold you your GUARDIAN generator. How do I select a generator that’s right for me? The most accurate way is to have an electrician apply an amp meter to the circuits or appliances that will operate with emergency backup power. Measurements should be taken as the appliance starts up. That’s because start up requires the greatest amount of power. To eliminate the hassle of this process, GUARDIAN allows you to simply match your system to the existing circuits in your electrical panel. With our 8, 10, 12 or 16 circuit, pre-wired systems, we take the guesswork out of sizing. For customers concerned with air conditioning, the wattage rating of the generator and its circuit breakers inside the transfer switch should be reviewed so that A/C startup power requirements are met. For GUARDIAN QuietSource™ liquid-cooled models, a licensed electrician must perform a site survey to determine the size and voltage of the unit to meet your backup power needs. How long does it take to install an automatic standby generator? GUARDIAN air-cooled models, which come equipped with a comprehensive installation manual, can take as little as four hours to install. They come pre-mounted on a composite pad to further simplify installation. Liquid-cooled generators normally require up to 14 hours to install. Because of their additional weight, liquid-cooled units must be installed on a stronger mounting surface such as a concrete slab. Copyright 2018 Tievy Electric Inc. All Rights Reserved.